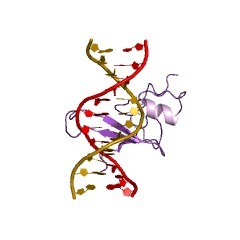 Methylation at CpG dinucleotide, the most common DNA modification in eukaryotes, has been correlated with gene silencing associated with various phenomena such as genomic imprinting, transposon and chromosome X inactivation, differentiation, and cancer. Effects of DNA methylation are mediated through proteins which bind to symmetrically methylated CpGs. 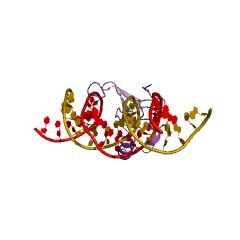 Such proteins contain a specific domain of ~70 residues, the methyl-CpG-binding domain (MBD), which is linked to additional domains associated with chromatin, such as the bromodomain, the AT hook motif,the SET domain, or the PHD finger. 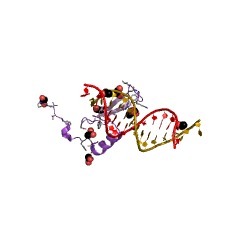 MBD-containing proteins appear to act as structural proteins, which recruit a variety of histone deacetylase (HDAC) complexes and chromatin remodelling factors, leading to chromatin compaction and, consequently, to transcriptional repression. The MBD of MeCP2, MBD1, MBD2, MBD4 and BAZ2 mediates binding to DNA, in case of MeCP2, MBD1 and MBD2 preferentially to methylated CpG. 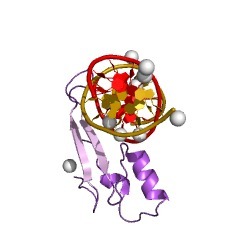 In case of human MBD3 and SETDB1 the MBD has been shown to mediate protein-protein interactions [(PUBMED:12529184), (PUBMED:12787239)]. 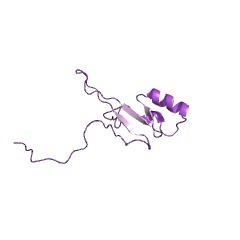 The MBD folds into an alpha/beta sandwich structure comprising a layer of twisted beta sheet, backed by another layer formed by the alpha1 helix and a hairpin loop at the C terminus. These layers are both amphipathic, with the alpha1 helix and the beta sheet lying parallel and the hydrophobic faces tightly packed against each other. 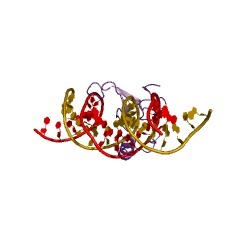 The beta sheet is composed of two long inner strands (beta2 and beta3) sandwiched by two shorter outer strands (beta1 and beta4) [(PUBMED:11371345)]. 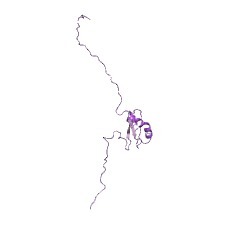 There are 3240 MBD domains in 3233 proteins in SMART's nrdb database. Taxonomic distribution of proteins containing MBD domain. This tree includes only several representative species. The complete taxonomic breakdown of all proteins with MBD domain is also avaliable. Click on the protein counts, or double click on taxonomic names to display all proteins containing MBD domain in the selected taxonomic class. 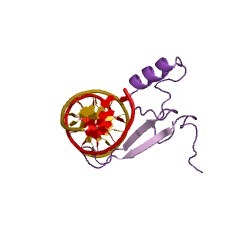 A mammalian protein with specific demethylase activity for mCpG DNA. DNA-methylation patterns are important for regulating genome functions, and are determined by the enzymatic processes of methylation and demethylation. 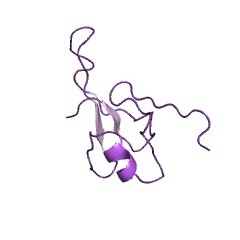 The demethylating enzyme has now been identified: a mammalian complementary DNA encodes a methyl-CpG-binding domain, bears a demethylase activity that transforms methylated cytosine bases to cytosine, and demethylates a plasmid when the cDNA is translated or transiently transfected into human embryonal kidney cells in vitro. 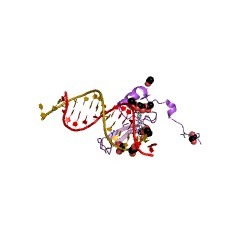 The discovery of this DNA demethylase should provide a basis for the molecular and developmental analysis of the role of DNA methylation and demethylation. 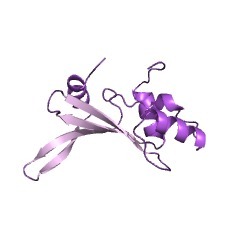 Dissection of the methyl-CpG binding domain from the chromosomal protein MeCP2. 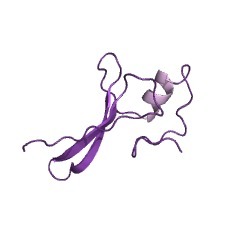 MeCP2 is a chromosomal protein which binds to DNA that is methylated at CpG. In situ immunofluorescence in mouse cells has shown that the protein is most concentrated in pericentromeric heterochromatin, suggesting that MeCP2 may play a role in the formation of inert chromatin. 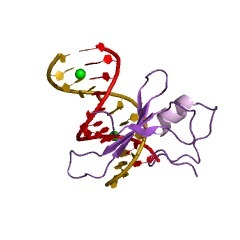 Here we have isolated a minimal methyl-CpG binding domain (MBD) from MeCP2. 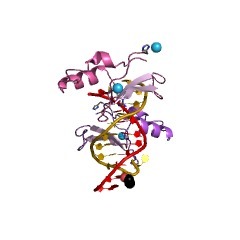 MBD is 85 amino acids in length, and binds exclusively to DNA that contains one or more symmetrically methylated CpGs. 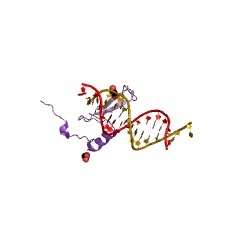 MBD has negligable non-specific affinity for DNA, confirming that non-specific and methyl-CpG specific binding domains of MeCP2 are distinct. In vitro footprinting indicates that MBD binding can protect a 12 nucleotide region surrounding a methyl-CpG pair, with an approximate dissociation constant of 10(-9) M.
SwissProt sequences and OMIM curated human diseases associated with missense mutations within the MBD domain. This information is based on mapping of SMART genomic protein database to KEGG orthologous groups. Percentage points are related to the number of proteins with MBD domain which could be assigned to a KEGG orthologous group, and not all proteins containing MBD domain. Please note that proteins can be included in multiple pathways, ie. the numbers above will not always add up to 100%.